Who was Giulia Frasi? This is so often the response I get when I mention the name of this Italian singer who came to London and became Handel’s last prima donna during the final decade of his life and, consequently, the supreme soprano of English music in the mid-18th century. Over the last five years or so, as I explored the music she inspired and performed, Frasi has become my own muse in a way. Music of the Baroque defines where my musical roots lie and has always been central to my repertoire. Some of my happiest memories are of performing music from this era. It was when I was researching some of my favourite Handel heroines that I discovered most of them had been composed for Giulia Frasi. I found myself especially drawn to the empathetic temperament and lyrical ease of the vocal writing embodied in roles such as Susanna, Theodora and Iphis. There is also a depth of expression and "realness" in the characterisation of these women which was hugely refreshing to perform. I can imagine these roles may well have subverted the norm at a time when women did not enjoy rights equal to those of men. With the help and support of musicologist and historian David Vickers, I started investigating the music and roles Handel wrote for Frasi and soon discovered that during her 31-year career, she led a culturally diverse life, performed in many different musical settings (including regular concerts at Oxford and the Three Choirs Festival outside of London) and inspired a range of composers and operatic producers beyond Handel. Reputedly trained in Milan and having made her operatic debut at Lodi (1740), Frasi came to Britain to join Lord Middlesex’s Italian opera company in autumn 1742 – not long after Handel had decided to stop composing and performing operas on the London stage. Frasi participated in at least 14 opera seasons at the King’s Theatre on the Haymarket between November 1742 and 1761 and rose through the ranks from minor to major roles in their productions. She was noted especially for her sweet and clear voice and her excellent English language diction. In 1743 Frasi also began her long association with the annual charity concerts in aid of the "Fund for Decay’d Musicians or Their Families" (which later became the Royal Society of Musicians) and it was at these events that she began to enlarge her repertoire with some of Handel’s English music. Handel first recruited her for the revival of Judas Maccabaeus (March 1748) – and that was the beginning of their association and when her star really began to rise. She sang in all of the Covent Garden oratorio concerts that Handel gave for the remainder of his life. One of Frasi’s characteristics that especially appealed to Handel was her ability to convey musical pathos. His admiration for this dramatic quality is evident in the roles he created for her: emotional journeys with vivid scenes of sentimental and spiritual drama that depict women reacting to distressing events with courage, dignity and selflessness are the trend. Just think of those noble heroines in Jephtha and Solomon, for example, with their moral stoicism. On delving more deeply into the archives we discovered other long-forgotten compositions for Frasi by composers such as Thomas Arne and John Christopher Smith, which complement Handel’s works. Their music for Frasi helped sustain her career after Handel’s death in 1759 and helped her maintain her position as the foremost principal soprano soloist of English works in the oratorio style. Having made these exciting discoveries, I felt a real desire to explore the catalogue through the process of recording. This allowed me to place well-known arias alongside other sublime pieces – many of which have never been heard in modern times – and set them down on record for future generations to enjoy. Frasi seems to have been an ambitious and indomitable woman, even when her star was waning. But her rather profligate lifestyle caught up with her in her later years when her career was also plagued with bad luck, poor planning, and some vocal problems. It is rumoured that after her last documented concert, at Hickford’s Room on 16 May 1774, she fled from her creditors to Calais and died there in destitute circumstances. Such a tragic end for an artist who inspired such sublime music that still communicates emotional resonance to audiences of every new generation. 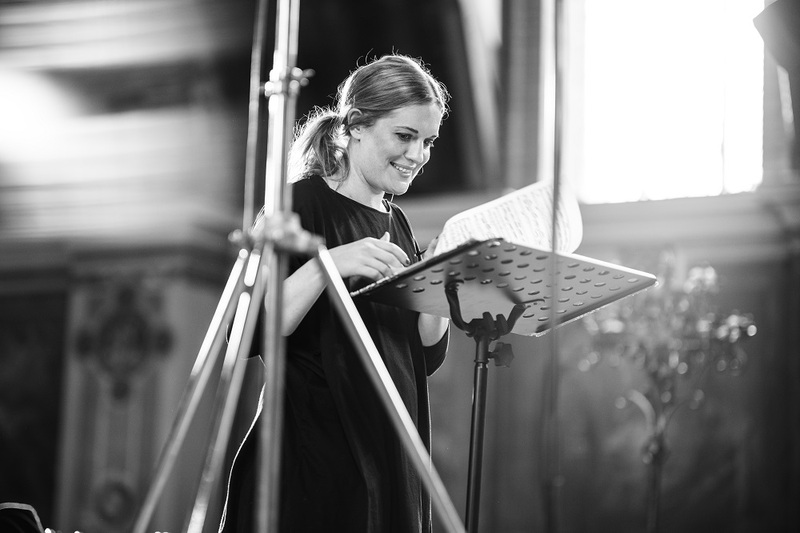 I had already started my research into Frasi when I was given a Borletti-Buitoni Trust award in 2014 – a sum of money and, as it turned out, a great deal more in the way of support and encouragement to help me bring to life this recording dream and my first solo Baroque album. 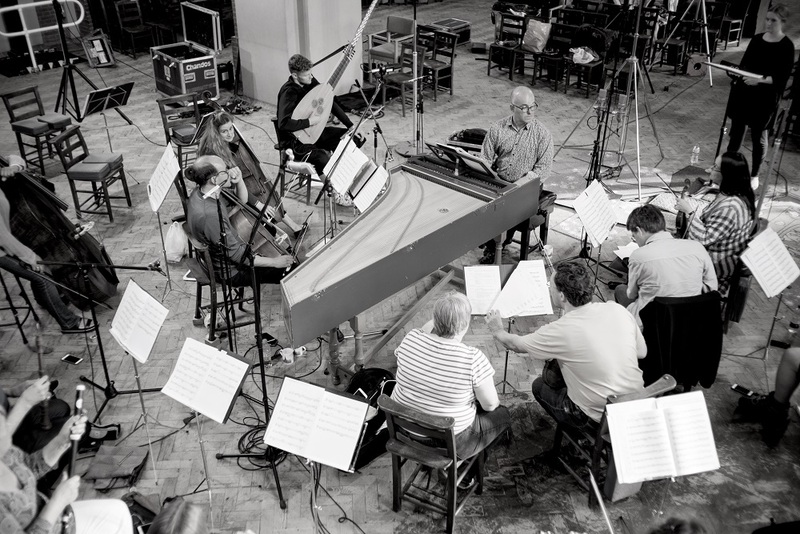 Indeed, my dream team was Laurence Cummings (my teacher at the Royal College and somebody I had performed with on many occasions) and the Orchestra of the Age of Enlightenment (session pictured above): together, they evoked great sensitivity, warmth and character in the music. Chandos Records has captured both the magic atmosphere of the church where we recorded and the music with real precision and warmth. During the process of recording I was keen to try and achieve a chamber music feel in the balancing of parts, and an impression that the voice was sometimes part of the orchestral texture, and not superimposed, and I feel we achieved that. But, more than anything, I am so pleased to have been able to present a story that has seldom been told and has never before been presented through a cross-section of Frasi’s musical repertoire.